Welcome to this week's Pals Paper Arts Challenge, a lovelysketch by our own Margaret Moody. I began my card with a 5-1/4" x 10-1/2" piece of Concord Crush card stock, which I scored at 5-1/4" and then folded. My next layer was Kiwi Kiss, cut to approximately 5" x 5". I used one of the new Adorning Accents Edgelit Dies to scallop one side of the square, and then used the the matching Adorning Accents Embossing Folder to emboss that same edge. The edges look so rich! On top of the Lucky Limeade layer, I placed a 4 x 5" Melon Mambo, which frames a slightly smaller piece of Cheerful Treat (hostess) designer series paper. The embellishments on my card are a Concord Crush 1/2" Stitched Poly ribbon, which is knotted on the left side. I used the Posy Punch (hostess) stamp set for this card. For the right side, I stamped a Melon Mambo flower and punched it out with the Fancy Flower punch. In the middle of the flower, I used one of the round images, stamped in Concord Crush Ink, then punched it out with a 3/4" circle punch. To add some zing, I used a Brights Glimmer Brad in the center. In the upper left portion of my card, I stamped "hello" in Melon Mambo and then punched it out wiht a 1" circle punch. It was matted with Lucky Limeade 1-1/4" punch. 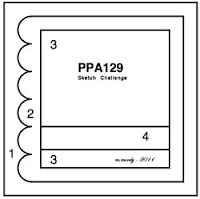 I hope you enjoyed this bright card using the PPA sketch. Please play along using your favorite colors and products. Please use my Website to order your Stampin' Up! products. Love this Patti! Great colors - great edging! And why don't I use Concord Crush more?? It's a great backdrop here - sets off the whole card! Beautiful, Patti! I could tell by the peek that I was going to love the colors! And the scalloped edge is the perfect touch! I love Cheerful Treats DSP and this card will be a cheerful "Hello" for somebody! Beautiful card, Patti! Makes me want to try using Concord Crush more often too! It looks great with Lucky Limeade and Melon Mambo! WOW! Patti! Love how vibrant and springy this is! Great palette!